The Quick Start method of teaching tennis uses racquets and balls sized in proportion to the age and ability of young players. Time is relative and so is tennis. A tennis court is 78 feet long and 27 feet wide, with a 42-inch-high net to rally the ball across - perfectly playable dimensions ... for an adult. Kelsey Wong practices by bouncing a low-compression foam ball off her racquet during a Quick Start tennis class at Punahou School. The ball, which is larger and softer than a standard tennis ball, is easier to hit and doesn't move as fast or as far, making it easier for children to learn the game. For keiki a tennis court is proportionally much bigger, making learning the sport awkward. When children are introduced to other sports, accommodations are often made in the size of the playing field, and the size and type of balls or other equipment used. Think T-ball as a step toward learning baseball, or basketball and soccer, in which playing fields are adapted to smaller leg spans and lung capacities. The logical move of downsizing a sport without altering the rules sets the stage for a faster, more efficient way to learn the sport. The U.S. Tennis Association's Quick Start Tennis format does just that. By adapting the actual dimensions of a tennis court for smaller players, Quick Start Tennis allows youngsters to "play to learn" versus "learning to play" on larger courts. In Quick Start, standard courts are divided, so no special courts need to be built, and net heights are adjusted as well. "With basketball you'd never think of starting a 7-year-old boy or girl out with a 7-foot-high rim," said tennis instructor Lee Couillard. "That's frustrating and inaccessible to the leaner. It's no introduction to a great sport." Couillard said the new approach creates a more exciting, less frustrating learning environment for children ages 8 and under, who play on a 36-foot court, and children 10 and under, who play on a 60-foot court. Courts are divided using temporary lines for both singles and doubles versions of the games. 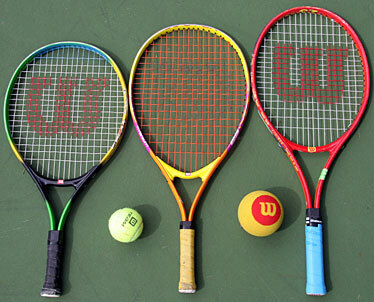 The Quick Start approach includes smaller racquet and ball sizes. This means kids succeed sooner, Couillard said, boosting confidence, enjoyment and a quicker development of technique and tactics. "The concept was to reinvent what a child experiences in tennis and make it the best possible introduction." 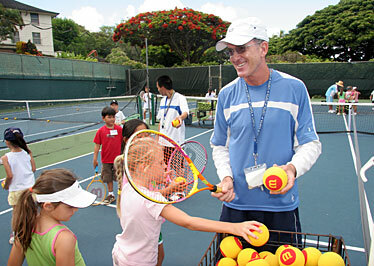 Lee Couillard hands out racquets and balls to children in his summer tennis class at Punahou School. The Quick Start tennis format was introduced last month to Hawaii's U.S. Tennis Association coaches, who handle group tennis lessons at 22 park sites, many involving youths. The format is now formalized across the country, and set to become a standard for USTA programs and classes. "Europe has had a similar program for many years," said Lee Couillard, USTA head professional at Punahou School. "We were slower to embrace it in the U.S., but it's been extremely well received by kids and parents." Couillard coaches at Punahou during the school year, and recently began summer programs using the new format. 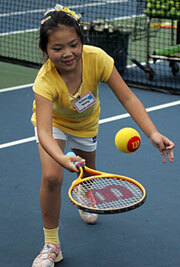 "Quick Start tennis is real tennis for kids. It's not easier, just more appropriate." Couillard emphasizes that his students become intrigued by the game more quickly while playing on downsized courts using equipment that better fits them. 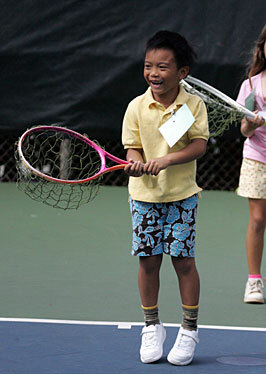 Kids practice in teams in Quick Start tennis classes at Punahou School. "The rationale is simple and workable," he said. "If a kindergartner's first experience with tennis is on a regular-size court, they get lost. The racquets are too heavy and the balls can be dangerous." With Quick Start, young players use low-compression foam balls, designed specially to move slower, bounce lower and travel less distance. When students progress from the age 7-and-under to the 10-and-under group, the balls are different again, moving a little faster but still slower than regulation balls. The size adjustments were also made with a child's endurance in mind. The point of tennis is not to run a long distance - which kids end up doing on a regular court. "With Quick Start the kids are not tired out from running too long. They can focus on developing real skills and see real progress," said Couillard. Madeline Dreith, a USTA tennis service representative, said Quick Start also improves competitions. "It's simplified the scoring system so that the 8-and-under group play to seven points in a game, keeping it short and sweet. They play the best of three games." This way, youngsters don't play for more than 20 minutes in a match, keeping playtime realistic and reducing the chance of overexertion and injury, she said. With Quick Start tennis catching on nationally, Dreith expects an increase in the popularity of tennis as families begin to see it as an accessible and rewarding sport for their kids. "Junior Tennis leagues will become more successful as students come through Quick Start backgrounds with higher confidence, skills and experience," she said, adding that kids, with Quick Start, can start serving, volleying and rallying the first time they pick up a racquet. Leyton Ramos uses a special netlike training racket. The approach also turns tennis, usually an individual sport, into a team sport. Kids practice in teams, just as they would in soccer, baseball or football. This provides a camaraderie not usually found in tennis instruction. Team matches give students the chance to learn values of sportsmanship and enjoy time with friends. Leagues can be started anywhere courts are available, and can be registered with the USTA. Coaches, whether professional or amateur, are finding Quick Start integrates well into their existing programs. Couillard said the format works as a good lesson plan and would help with management in a classroom. "It's methodical, it's organized and it's fun." 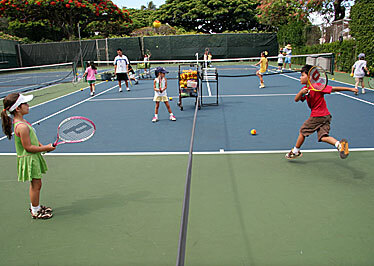 To find a class in Quick Start tennis, call the Hawaii Pacific Chapter of the U.S. Tennis Association, 955-6696.